It's no longer a shock to see a dad on the playground, at the pediatrician's office, or among the ranks of the PTA, and this is cause enough for celebration on Father's Day. The hands-on dad is here to stay. But among their ranks are a few pioneers who are redefining fatherhood in an especially exciting way. These men are working with their spouses to carve out equality both at home and at work so that parenting, career advancement, and all of life's rewards and challenges are shouldered and shared. This means both parents spend nearly equal time raising their children, and make the necessary career compromises, such as reducing hours or taking family leaves, to do so. In families aiming for "equal parenting" or "shared care," one career doesn't take a backseat to the other, and no parent is the domestic chieftain. For dads, even more than moms, shared care involves bending all the old rules and shedding gender norms. "We've seen families where the mom is flexing or where one parent stays home, or where everybody's working, but we haven't figured out families where the mom flexes and the dad flexes, and that's the one that requires the most change at home and at work," says Jessica DeGroot, head of the Third Path Institute, a Philadelphia nonprofit devoted to helping families and employers explore new ways to redesign life and work. You can check them out at thirdpath.org. 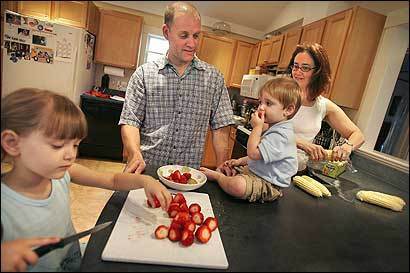 So how do shared-care dads and their spouses do it? They work at the cutting edge of changes from flex-work to hands-on fathering. In essence, they're doing what we're doing, only more so. Take the example of leaves. Nine percent of working women take a leave under the Family and Medical Leave Act during any 18-month period, compared with 4 percent of men, according to a study published in December by Naomi Gerstel, a sociology professor at the University of Massachusetts at Amherst, and researcher Amy Armenia. Bill Taussig, a lawyer and father of three sons, is a pioneering leave-taker. Ever since his first child was born nine years ago, he's pushed his employers to let him be an equal parent at home. While working at a law firm, he took a four-month leave after the birth of his oldest child. Then after joining a large Boston financial services company, he carved out an 80 percent and now a 90 percent schedule, despite the opposition of some managers. "I was struck by how long it took to negotiate for what I wanted, and how each subsequent boss was reluctant to stick his or her neck out for me," says Taussig, whose wife Alexandra, a marketing executive, also takes every other Friday off to stay home in Needham with their children, ages 9, 7, and 2. "And this was in a group that had women who were doing this." His efforts have paid off. In February, Taussig was promoted to vice president, and he relishes his time with his children. "I know now that I don't want to just be a 'good provider,' I want more," says Taussig. "It's just not the same if you are only there on weekends." His advice for those who want shared care: keep pushing for flexibility at work, and be creative. At home, what's the secret to shared care? Leave behind domestic turf wars. As mothers have ventured out to work, fathers have been moving into new home territories. Fathers' time spent on housework has doubled and their hours of child care have tripled since the 1960s, according to research compiled by Scott Coltrane, a sociology professor at the University of California at Riverside. Yet women still do more than men on both counts, and tend to supervise the domestic sphere. "That doesn't work for us," says Marc Vachon, father of a 5-year-old daughter and a 2-year-old son. Since their daughter was born, he and his wife, Amy, have both worked about 30 hours weekly, and they split housework and child care as equally as possible. But that took negotiating, and also ceding control on Amy's part. "I remember the day I left to go back to work after my four-month maternity leave. I said to Marc, 'Maia gets this food at this time, and you microwave it for 'x' seconds," recalls Amy. But Marc refused the to-do list. Says Amy: "I was just being -- what's the word?" "Controlling," interjects Marc during a joint telephone interview, she from work and he from their home in Watertown. She works as a clinical pharmacy coordinator at Harvard Vanguard Medical Associates and he is looking for work after recently losing his IT job due to corporate outsourcing. "One of the biggest hurdles is women letting go," says Marc. To smooth the way to shared care, talk about household standards. Will you dust weekly or monthly? Are two veggies mandatory at dinner? At first Amy resented that Marc did laundry only on weekends. Now she does the whites (often), and he does darks (weekly). "I just bought an extra pair of jeans," laughs Amy, who also blogs with Marc on the subject of shared care at their website equallysharedparenting.com. When shared care really works, domestic negotiations recede, and each partner knows how and when to pitch in. There is trust: One parent will perhaps do more at home or work this week or month, and then the other will step up. Shared care frees us from the little boxes called "work" and "home." So, hats off today to the dads who are helping break down those walls.